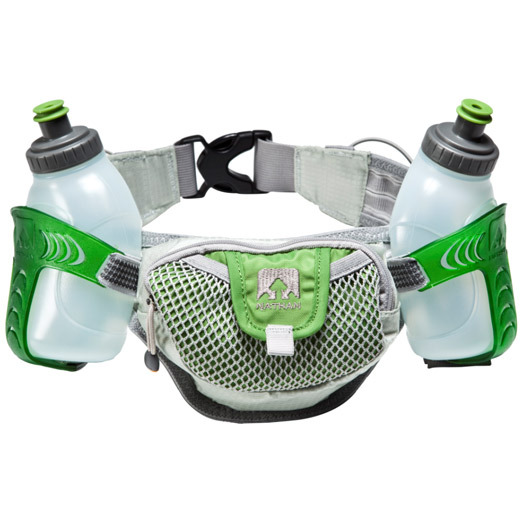 The Green Girl recently purchased a green Nathan Trail Mix hydration belt. I'm a huge fan of Nathan products. I started off with the Nathan Speed 4 back when I trained for my first marathon. When it came time to replace that belt for a smaller one to fit my shrinking waist, I replaced it with another Nathan Speed 4. I was planning on getting another replacement Speed 4 when I ran across a green Nathan Trail Mix at CitySports.com. 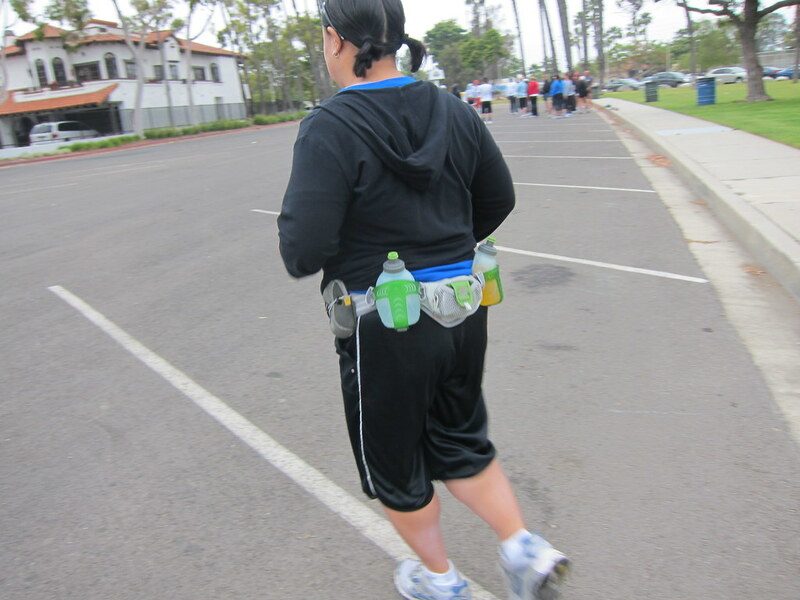 Without hesitation, I placed my order and waited for my green hydration belt to arrive. When the package arrived and I ripped it open, the green molded hosters were everything a Green Girl could dream her bottle holders to be. I was surprised to see how compact the Trail Mix was compared to the Speed 4. The dimensions on the Trail Mix are 13"(W) x 2"(D) x 3.5"(H). Instead of a velcro fastener, there is a strap that adjusts to fit waists from 26" to 42". According to the manufacturer, the belt's open construction was designed to dissipate heat and reduce chafing. I was pleased to see the spacious rear pocket with a zipper closure. 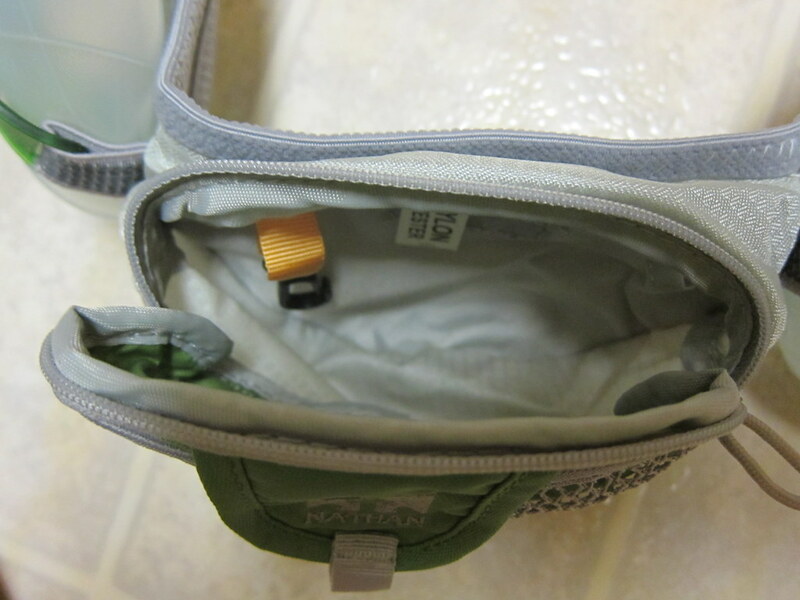 The main compartment has a small internal pocket that includes a key connector. 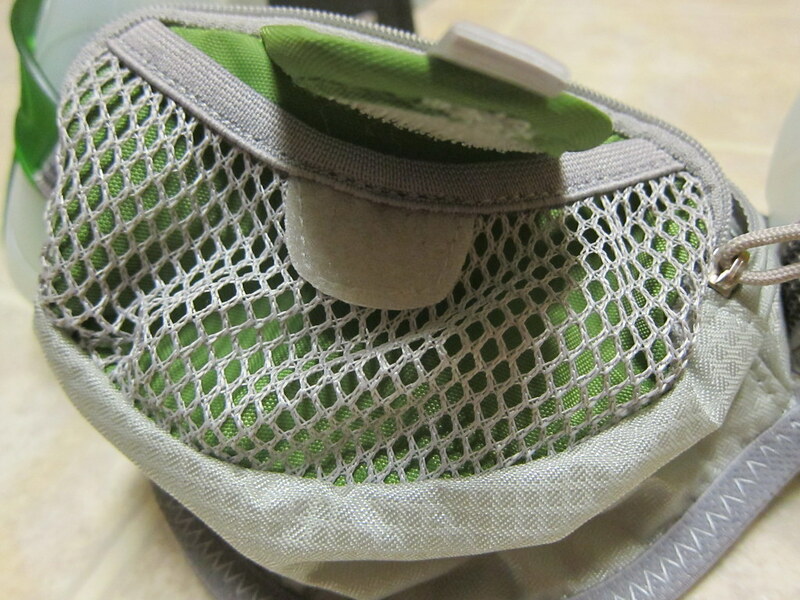 There's a small mesh pouch on the outside that is secured with a velcro flap. Towards the front of the belt there are shock cords with tension locks on either side. I slid my Nathan pockets in the elastic bands and I was ready to go. I wasn't if I would like the adjustable strap after years of running with a velcro closure but it was surprisingly comfortable. The back section of the belt is thicker and wider than the strap portion in front. I couldn't even feel the large plastic clip and once I tightened it, it remained snug. Like the Speed 4, there was minimal bouncing even with the weight of two bottles and my camera. I thought I'd miss the Speed 4's additional front pocket but when my mobile phone fit perfectly in the rear outside mesh pocket, I was sold. This is actually an improvement because it's stored as far away as possible from my sweaty body. 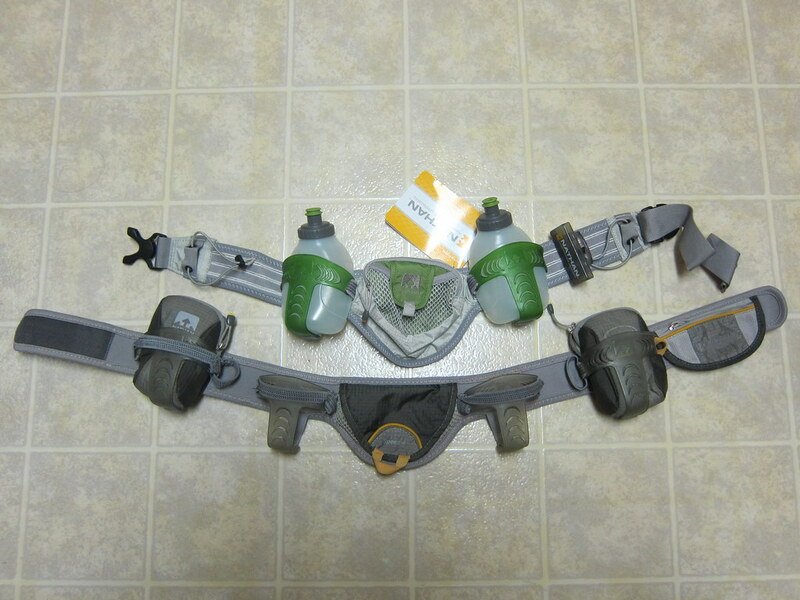 I didn't think it was possible to improve upon the Speed 4 but Nathan managed to create hydration belt perfection with the green Trail Mix. Nice looking belt! 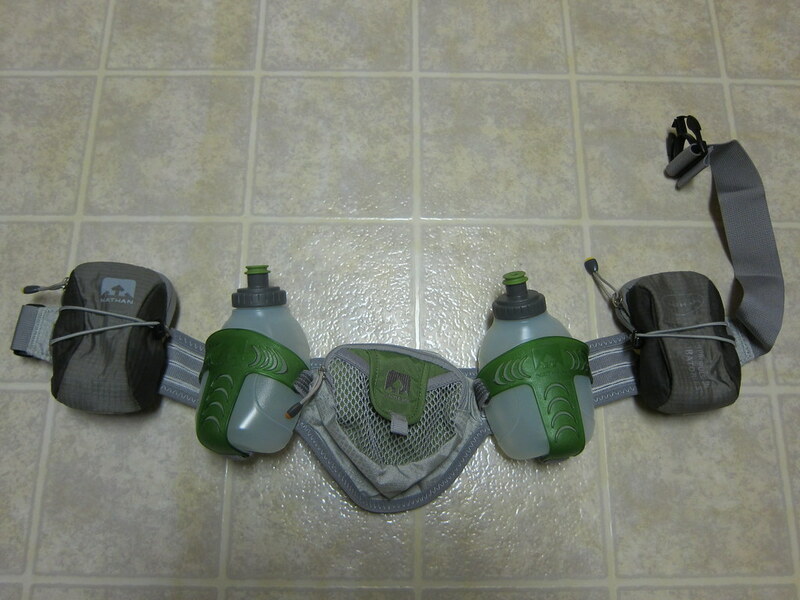 My only fear with a two bottle belt is that's not a lot of liquid if you're on a longer trail run. I use a 70 oz Nathan hydration pack myself.